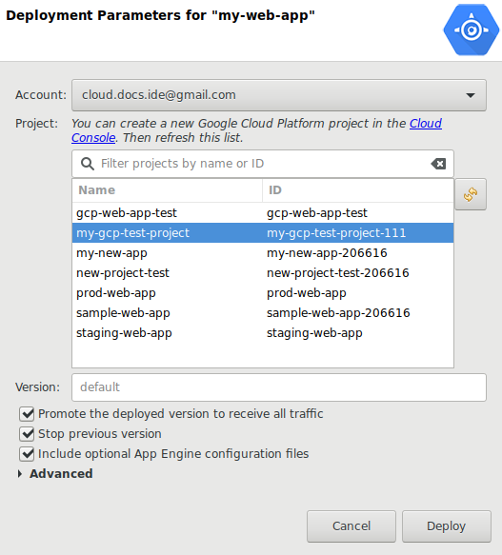 This page takes you through the steps of creating a new App Engine app in the Google Cloud Platform Console, authenticating with Google, and deploying your project to App Engine. Ensure that the appengine-web.xml file is in the WEB-INF folder of your web application. Right click the project in the Package Explorer to bring up the context menu. Select Configure > Convert to App Engine Project. Right click the project in the Package Explorer to open the context menu. Select Deploy to App Engine Standard. The list of projects the account has access to loads. Select the one you want to deploy to. A background job launches that deploys the project to App Engine. The output of the job is visible in the Eclipse Console view. By default, App Engine stops the previous version of your application and immediately promotes your new code to receive all traffic. 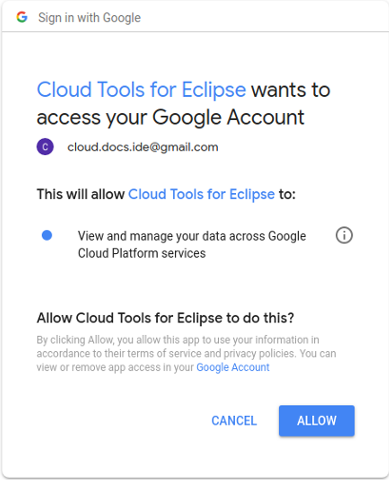 If you'd rather manually promote it later using gcloud or the Google Cloud Platform Console, uncheck Promote the deployed version to receive all traffic. If you don't want to stop the previous version, uncheck Stop previous version.